Are you scared of spiders? Do you have arachnophobia? 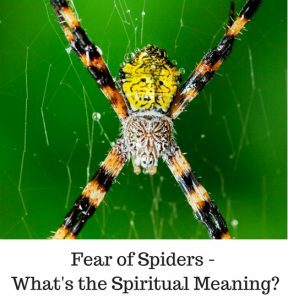 Ever wondered what spiders represent spiritually? Then this article is for you! As a psychic reader, I believe that everything in life can be a sign from the Universe – even bugs. Spiders are a spirit animal. They invite us to embrace our shadow side,including our fears of mortality, aggression, and repressed creativity. In numerology, SPIDER adds to 1+7+9+4+5+9 = 35/8, the same vibration as words like CREATOR, MOUNTAIN and WATERFALL. So spiders symbolise the ‘force of nature’. The number 8 relates to the Karmic Pattern (8th) Chakra, which is about our relationship to God, the big picture and abundance. The infinity ‘8’ suggests that’what goes around comes around’ – no wonder words like KARMA and FAITH also have an 8 vibration. Spiders also have eight legs. People with a 35/8 lifepath in numerology, like Nelson Mandela and Cate Blanchett, can’t be controlled – they were or are free-spirits who heroically rise to a challenge, have an active, inquiring mind and become ‘self-made successes’, according to Dan Millman, a 26/8 lifepath. Find your lifepath. My friend Veronica Farmer is a 35/8 lifepath, who runs Angels Rest Relaxation Clinic. My baby and I love her craniosacral treatments. 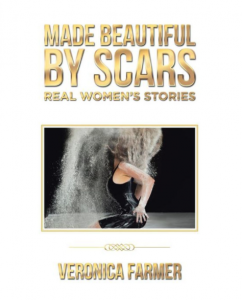 She has created an incredible book of real-life recovery stories, called Made Beautiful by Scars. New stories are always welcome. What Do Spiders Represent? What is their Animal Totem Meaning? Spiders represent opportunism. They prepare for success, can make a living anywhere, and jump on new ideas before they get away. Their confidence is incredible. -Do I control my life, or do I feel trapped in a web of words/ lies? -Where do I avoid confrontation? Where do I let small things stop me? Do I feel bullied? Is 2016 the time to take back my power? -Am I willing to receive my good from the Universe? Do I trust that, if I turn up well-prepared, Spirit will send me what I need (through the Law of Attraction)? -Where can I enlarge my social and online networks? -Who taught me that spiders are evil? Do I still want this belief? -Am I scared of looking like the bad guy? How would life be if I held my ground? After all, leaders need to lead themselves first. Do I see the world as a hostile place of competition, where I must ‘kill or be killed’? What would happen if I let go of this false belief? -Where am I afraid to start again? Where have I clung to broken ways? Spiders often remake their webs, they see it as part of life. -How can I be more creative? How can I use my magic powers to make life visually stunning? Spider webs are so beautiful in the sun. -Do I let the fear of death control my life? As I’ve read in books, ‘until you learn how to die, you don’t know how to live’. Read about my how my friend Butterfly’s death totally inspired me. -Do I enjoy ‘pulling things out’ at the last minute and living according to my intuition? Spiders are associated with witches and psychics as you may know. Australian Funnel-web Spider – Are you often on the defensive? Do you feel trapped in life or free to roam? Do you criticise yourself or others (i.e. eject toxins) easily? How can you make life more peaceful by healing your inner and outer critics? Daddy Longlegs Spider – Where do you need to stretch out and use your legs/ physical body to move forwards? Where could you intelligence and speed, rather than force, to accomplish your goals? Do people think you are weak when you’re actually strong? Note: it’s not true that Daddy Longlegs are the most poisonous spiders in the world, but can’t hurt us because of their short fangs. Their venom is no more powerful than other spiders, see this article.However, they do attack and eat Huntsman and Redback spiders. BTW, Daddy Longlegs is another name for Cellar Spiders in Australia – in other countries this can refer to a different species. Golden Silk Orb-Weaver Spider – Are you willing to stand out? Do you let your creative work see the light of day? When things get sticky, do you enjoy the journey? Are you ok with being a shining, example of Love? Some people are here to weave a big web (create massive change in the world), and produce dazzling results. If this sounds like you – remember to rest in between projects, you are priceless my darling! Huntsman – Are you ready to live a bigger life? is it time to pursue some worthy goals? Where do you need to use your size and reputation to protect your territory? Do you raise your babies/ ideas (brainchildren) in a healthy or overbearing way? Are you craving the company of leaders? These spiders are quite social. Redback Spider – Do you give people enough warning before getting angry? What would life be like if you said no to poisonous relationships at home? We all have a right to feel safe. Also – do strong women, or does the thought of being a strong woman frighten you? Female Redback Spiders are larger and more venomous than males – they also eat their partners after mating! Many authors link Spiders with Femininity and the Goddess. Note: Baby Redbacks are known to cannibalise each other. So this spider can also represent stressful times when there isn’t enough food/ money/ space for people to happily co-exist. Sometimes, we need to leave dangerous situations without looking back. St Andrew’s Cross Spider – Similar traits to the Golden Silk Orb-Weaver spider. Do you always live in the spotlight? Are there times you attract unwanted attention because of your beauty? Are you expressing your inner treasures and ideas (X marks the spot)? These spiders sit in their webs during the day, making them a greater target for predators. They could represent someone who’s willing to take great risks for even greater rewards. I love them. White-tailed Spider – When you’re in pain, do you let things fester or ask for help? Do you take things at face value or think for yourself? Are there any ‘energy vampires’ or people in your life who you keep trying to fix and change? Even minor irritations can expand if ignored. Why not face things before they swell up? Note: These spiders have been the subject of media attention for apparently causing flesh ulceration – ‘necrotising arachnidism’ however research does NOT back this up. Ah, spin doctors! 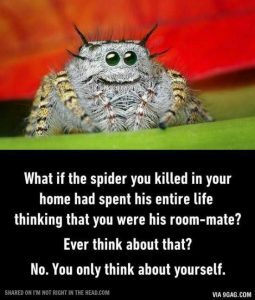 In conclusion, spiders can be profound animal totems when we need Divine inspiration. However, if your fear of spiders has become crippling, please seek help. Life’s too short to stress out, especially if you have kids. They learn from you whether the world is a safe place, or a scary ordeal.My suggestions for healing arachnophobia include: personal or group hypnosis (see this article) NLP, counselling, kinesiology and Emotional Freedom Technique (EFT). Just Google these modalities plus spiders and you’ll find many interesting case studies. Look for a local practitioner, so you can regain your headspace. I hope this article has given you some helpful ideas on spiders and their metaphysical significance. Yes, spider bites can hurt, but there have been no deaths from a confirmed spider bite in Australia since 1979. That’s 37 years! I shudder to think of the trillions of spiders who have been killed in that time. What a shame for our ecosystems. Please remember that, even the biggest spider in the world (the South American Goliath birdeater) weighs only 170 grams. Yes, grams. That’s not even your lunchtime sandwich. If you are a 70kg human, it’s just 0.2% of your mass. Everything is made of energy and love. What you judge, you become. Don’t let your fears shrink you, until you crawl through life. Better to live one day as a lion than a lifetime as a lamb. 1) After watching the 1990 movie ‘Arachnophobia’. Note to self: do not show your sensitive, psychic child horror movies unless you are prepared for nightmares. It would have been better if I’d watched the show in the daytime, but I saw it just before going to sleep. My thoughts now: I was struggling at school and already stressed. So it didn’t take much for me to panic – spiders (and problems in general) appear scarier if we are already in fight-or-flight mode. They’re a sign we need a reality check and more rest. 2) While working in Darwin, a Huntsman spider lived on the wall behind my toilet. What a recipe for constipation – I hated sitting down with my back to it. The first time I moved the spider, it came back. So one night, I drove it down the road. Problem solved. My thoughts now: I was so lonely living away from my loved ones. At the time, I’d never had counselling so I kept the sadness inside. As someone who often dreams about clogged toilets (i.e. stuck feelings), the spider was inviting me to release my fears of letting go and to deal with problems instead of denying them. 3) Soon after Forrest Bump’s birth, another Huntsman turned up in my study. This made it hard for me to meditate or do any writing. So I asked my fiancé, Kris, to evict it. As mentioned in this post on cockroaches, he is a vegetarian, who loves all creatures. Ever the rebel, Kris moved it – into the lounge room. When I complained, he said ‘Huntsman are good – they eat mosquitoes and cockroaches’ – see this article. So I gave in, and Captain Huntsman lived for months on our ceiling. My thoughts now: Giving birth was fairly easy, but the pressure of breastfeeding and sleep deprivation left me anxious after Forrest arrived. At the time the spider appeared, I hadn’t left the house for weeks, in case something happened to baby. All high flyers need a spiritual safety net. Thank goodness for my healers and teachers (especially Caroline Byrd and Alison Lee). I ended up getting assistance with cleaning the house, preparing meals and ordering organic fruit and vegetables from Spray Free Farmacy in Brisbane. My friend Jody also helped big-time. Phew! Again, the spider was a sign that I needed help to overcome my outdated beliefs. Not only did Captain Huntsman inspire this blog, when he/ she died, Kris buried him/ her in the garden. Thank you, little Messenger. Rest in peace. Fear of Cockroaches – What’s the Spiritual Meaning? -Write me feedback below! Comments will be published once they have been approved.Or, for greater clarity, book a phone or Skype reading with me to discover your soul contract and 2016 forecast. My current waiting list is 6+ weeks for new clients. It’s worth the suspense – see previous clients’ feedback. I also teach numerology workshops in Brisbane and palmistry. My Psychic Reading for Ed Kavalee on Triple M’s Marto, Ed and Robin Show! I found your blog entry because I have a spider as my spirit animal. Lately they are appearing constantly, and during a time when my arachnophobia seems to be getting worse again. Anyway, I saw that no one had left a comment, so even though I’m resurrecting an old post here, I wanted to let you know that at least one person found it helpful and really appreciates you having taken the time to write this! Thank you!